by Shannon Mullett-Bowlsby for Shibaguyz Designs and Leisure Arts. 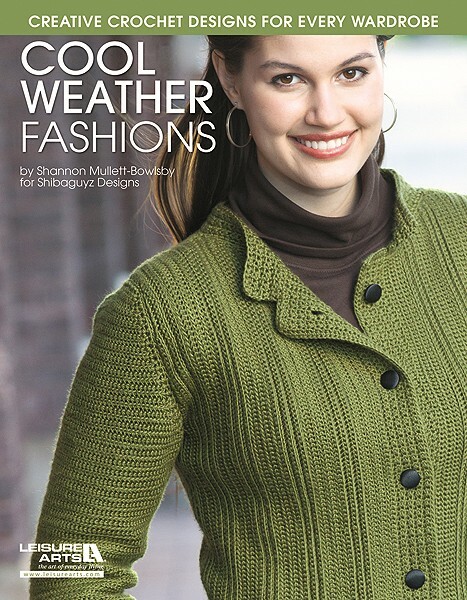 I am honored to be reviewing one of Shibaguyz’s newest crochet pattern books, Cool Weather Fashions. Shannon Mullett-Bowlsby is one of my favorite crochet wearables designer. His designs are trendy, cutting edge and very well designed. Your won’t have any guesswork when you crochet one of Shannon’s designs. Cool Weather Fashions is no exception. The designs in this book look fun to crochet. Each one is perfect for Fall, Winter and even early Spring. They are all classics with a new spin and can be your ‘go to’ pieces for everyday wear. This crochet book has wonderful large photographs and easy-to-understand schematics. The shapes of the crochet pieces look easy to do, yet the details of these designs take ‘easy’ to the next level. Sizes run from X-Small (33″ chest measurement) to 3X (53″), a great size range! and the Vintage Opera Jacket, with it’s trendy bulky weight collar and ‘over-the-hand’ sleeves! You can purchase this book at Amazon or on the Leisure Arts website. If you click on the NAME of each design below it’s photgraph, the link will take you to it’s Ravelry page for more information! Would you like to own this book? Leisure Arts has graciously offered to give away a copy of Cool Weather Fashions to ONE lucky winner! To be eligible to win, please COMMENT below. Let us know which sweater from this book is your favorite design. PLEASE, PLEASE do not forget to include your email address, or I will not be able to contact you! One winner will be chosen at random on Wednesday, January 23, 2013. Thank you to all who participate! DISCLOSURE: Leisure Arts provided Cute Crochet Chat with a free review copy of Cool Weather Fashions.